The add mode is used to register a new recognition codes while still retaining codes already registered. This mode is used to add a new transmitter. If the number of registered codes exceeds 4, the previously registered codes will be erased in order, starting from the first registered code. The rewrite mode is used to erase all the previously registered codes in order to register all new recognition codes. This mode is used to exchange the transmitter or the door control receiver for a new one. The prohibition mode is used to erase all the registered codes and disables the wireless door lock function. Use this mode when the transmitter is lost. The confirmation mode is used to confirm how many recognition codes have already been registered before an additional registration of the recognition codes. (a) Make sure that the vehicle fulfills the following conditions. The driver side door is opened (The other doors are closed). The driver side door is unlocked. Insert the key into the ignition key cylinder, then pull it out (Perform this operation once again within 5 seconds). Close and open the driver side door twice. Insert the key into the ignition key cylinder, then pull it out. Insert the key into the ignition key cylinder, then close the door. To select a mode, turn the ignition switch from ON to LOCK at approximately 1 second intervals according to the number of times shown below. Then remove the key from the ignition key cylinder. If the number of ON-LOCK operations of the ignition switch is 4 or more than 5, the registration will end without any signs. Within 3 seconds after a mode has been selected, the MPX ECU automatically performs LOCKUNLOCK operation to inform the operator which mode has been selected. When the confirmation mode has been selected and 0 codes are registered, LOCK-UNLOCK operation is automatically performed 5 times. 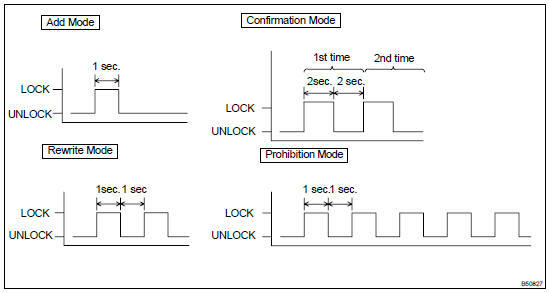 When the confirmation mode has been selected and LOCK-UNLOCK operation has been performed twice as shown in the illustration below, the number of the registered recognition codes is 2. HINT: When the prohibition mode or the confirmation mode is selected, the registration mode ends. Within 40 seconds after the add mode or the rewrite mode has been selected, simultaneously press the LOCK and UNLOCK switches for 1.0 to 1.5 seconds. Then press either one of the switches for more than 1.0 second. NOTICE: Press and hold both switches for 1 second or more during each press. However, the time between the 1st press and the 2nd press must be under 3 seconds. LOCK-UNLOCK operation is automatically performed once within 3 seconds after above operation (step 1), when the recognition code of the transmitter has been registered correctly. If the LOCK-UNLOCK operation is performed twice, the registration of the recognition code has failed. In this case, register the recognition code from the beginning of the registration procedures once again. In order to continue in registration mode, start the next registration within 40 seconds after the previous one. HINT: The maximum number of the recognition codes that can be registered is 4. (d) If even one of the following conditions is satisfied, the registration mode will end. 40 seconds have elapsed under the condition that the registration mode is ready. The driver side door is opened. The key is inserted in the ignition key cylinder. 4 recognition codes are registered at once.